Which teams do Mormons like most? The New York Times recently published an interactive map, A Map of Baseball Nation, which shows what team is most liked in each zip code across the U.S., based on what team they have “liked” on Facebook. Its kind of fun to see the geographic spread of the fans. I was particularly intrigued to see how Utah appeared — looking at the county by county data no team gets the majority, and, I was surprised to find out, the Yankees and Red Sox were the most popular teams, depending on the area. Why would that be so? Do Mormons prefer the Yankees and Red Sox? I suspect that the preference for the Yankees and Red Sox doesn’t have anything to do with geography at all. Most likely the Yankees and Red Sox are the closest teams we have to national teams (despite Ted Turner’s best efforts) — the teams that most people will choose just because they have heard of them and because they win a lot. So, does this leave us with anything interesting we can say about Mormons and baseball? Without more information, I don’t think so. Mormons are dispersed in the U.S. in a particular geographic pattern, and sometimes that allows researchers to make assumptions about Mormons that are probably correct — Mormons are concentrated in areas that are highly Republican, and it is therefore no surprise that most Mormons are Republicans. 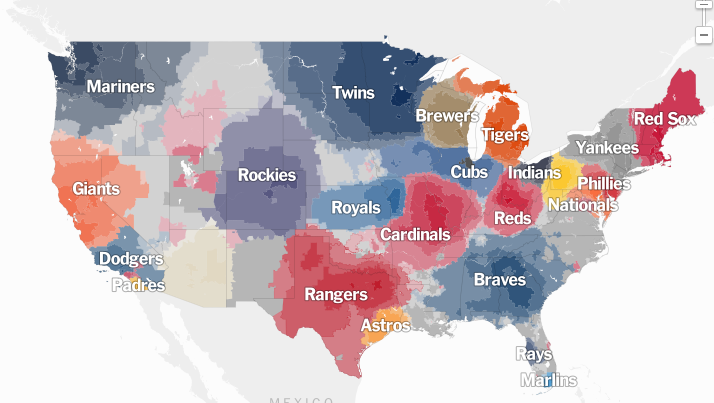 But the distribution of baseball fans on the Times’ map doesn’t really allow us to make such an assumption when it comes to baseball teams. In Utah 20-25% of fans seem to be Yankees fans, and another 20-25% are Red Sox fans, but that still leaves 50-60% of fans there who favor other teams. And Utah is only about 20% of Mormons in the U.S. (perhaps more if you exclude those who are inactive) — other large groups are found in Arizona (Diamondback fans often), Idaho and Wyoming (similar to Utah), Nevada (tending slightly to the Dodgers or Giants), California (split between Dodgers and Giants, but with As, Angels and Padres fans also), Oregon and Washington (Mariners fans), and so on. And this assumes that Mormon baseball fans follow the teams that others where they live follow — which is probably a good guess. But, sometimes individual players or groups of players can shift fans loyalties; its well known that African-American fans heavily favored the Dodgers for decades as a result of Jackie Robinson breaking the color barrier. Theoretically, players like Dale Murphy might shift fan loyalties, at least temporarily—are there more Mormon Braves fans than there might have been otherwise because of Murphy? Can we expect more Mormon Nationals fans because of Bryce Harper, assuming he matures spiritually as well as physically and in terms of baseball? While these players likely influenced at least a few Mormons, I have a hard time seeing that the effect was large enough to change the loyalties of a significant portion of Mormon baseball fans. But that is my guess. Its not based on any in-depth study. I’m curious enough that I wouldn’t mind seeing such a study. I suspect if the Yankees and Red Sox are the most popular, it’s because they are also the most interesting teams, win or lose. Personally, I’m “old school” (or just, plain old) and have a warm spot for Murph and Killebrew, but I loved Willie and the Mick also. My father grew up in Utah and chose the Pirates because the only accepted option in town was the Yankees and he was contrarian.